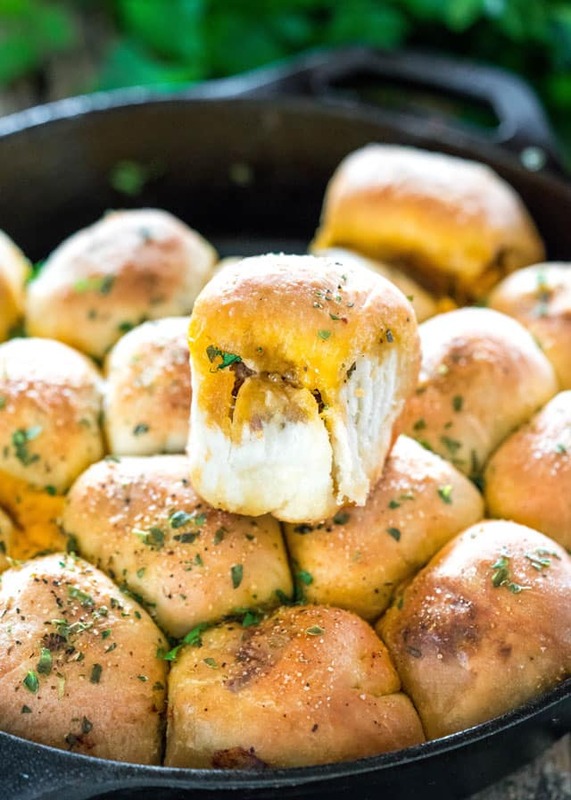 Cheddar Beef Skillet Pull Apart Bread – perfect for a snack, appetizer or school lunch! These rolls are filled with a tasty beef and mushroom mixture and lots of cheddar cheese! Great crowd pleaser! Hey guys! I have a great recipe for you guys today that your children will love. These rolls are filled with an easy to make but super tasty beef and mushroom filling and a piece of cheddar cheese in each one. Beef and cheddar, great combo and all rolled into a bread roll. 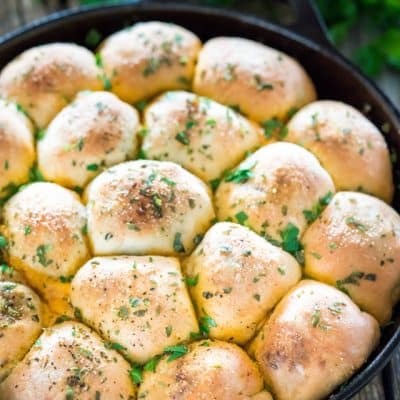 I love these frozen dinner rolls, I find them very versatile. All you have to do is let them thaw out at room temperature, mine took about 2 hours to become completely soft, but it could take longer depending on the temperature in your house. Another alternative to this is to use store bought pizza dough, or make your own, especially if you cannot find frozen bread rolls. The mixture is made with beef, onions, mushrooms, herbs and spices. This is a great way to hide those veggies for kids, they won’t even taste them in here. Of course you could use anything else if you don’t like mushrooms, like peppers, or spinach, add some celery and carrots, totally up to you. These rolls are so delicious and so fun to make, perfect to get your kids involved and have them help you make these. As these bake you get that nice bread baking aroma in your house, your neighbors will come calling. That could be a good thing or bad thing. Depends if you want to share or not. I like to serve these with some pizza sauce for dipping, but marinara sauce would work just as well. 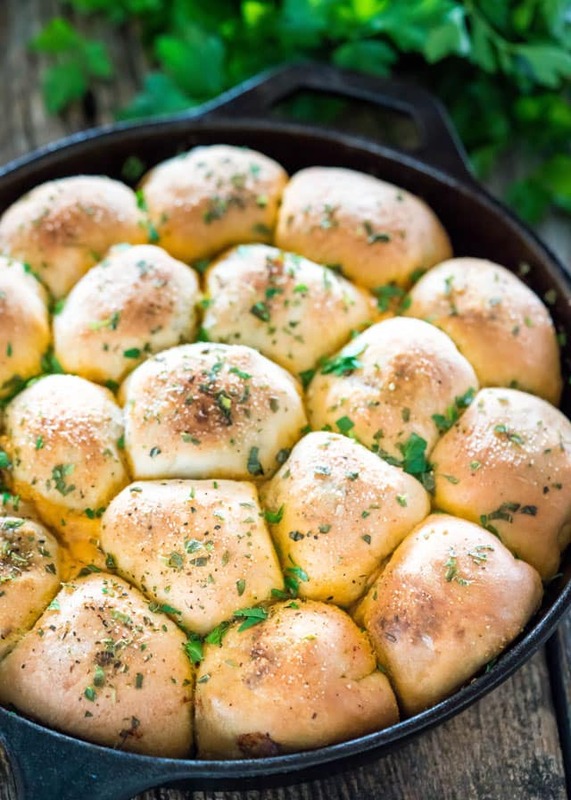 Cheddar Beef Skillet Pull Apart Bread - perfect for a snack, appetizer or school lunch! 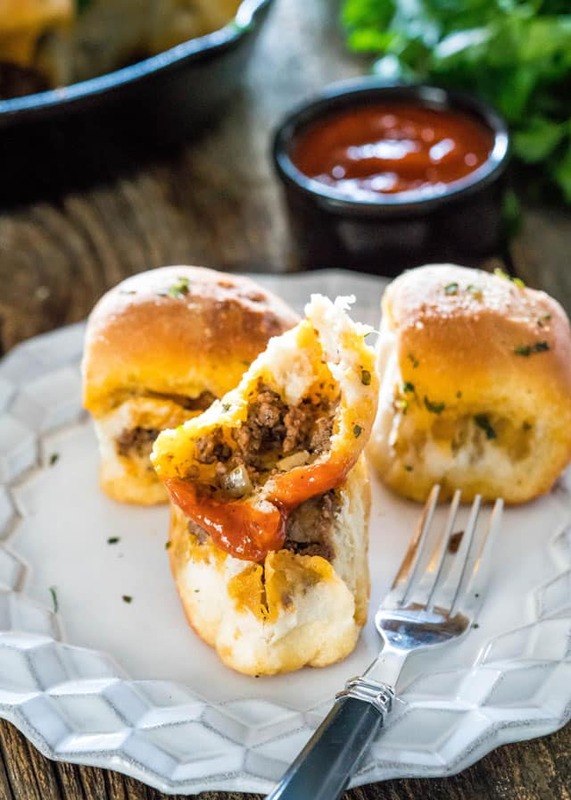 These rolls are filled with a tasty beef and mushroom mixture and lots of cheddar cheese! Great crowd pleaser! Thaw out the bread rolls at room temperature until no longer frozen, should take a couple hours. Heat the olive oil in a large skillet over medium-high heat. Add the ground beef and cook until it's no longer pink, breaking it up as you go along. Add the onion, mushrooms, basil, oregano, garlic powder, salt, pepper and stir. Continue cooking for another 3 minutes or until onion is tender. Stir in the pizza sauce and remove from heat. Let the mixture cool for about 10 minutes before using. Roll out each bread roll and fill with a couple teaspoons of the beef mixture and a cheese cube. Bring the dough up around the filling; press edge to seal and shape each into a ball. Repeat with remaining rolls and filling. Brush your skillet with some of the melted butter. Place the rolls into the skillet and brush well with butter. If preferred, sprinkle with some seasoning salt and dried basil. Place the skillet in the oven and bake 25 to 30 minutes or until golden brown. Garnish with fresh parsley and serve warm with pizza sauce for dipping. Feel free to have fun and mix up the sauce used for different flavors. For example, queso sauce or pesto would work well here. It looks really delicious~~ Thank you for sharing!! My kids will definitely love it! I am allergic to tomatoes. What could I substitute for the pizza sauce even though it changes the taste? I would think a cheesy dip (queso) would work nicely as a substitute for a tomato based sauce. Such an interesting recipe, I bet it tastes amazing. 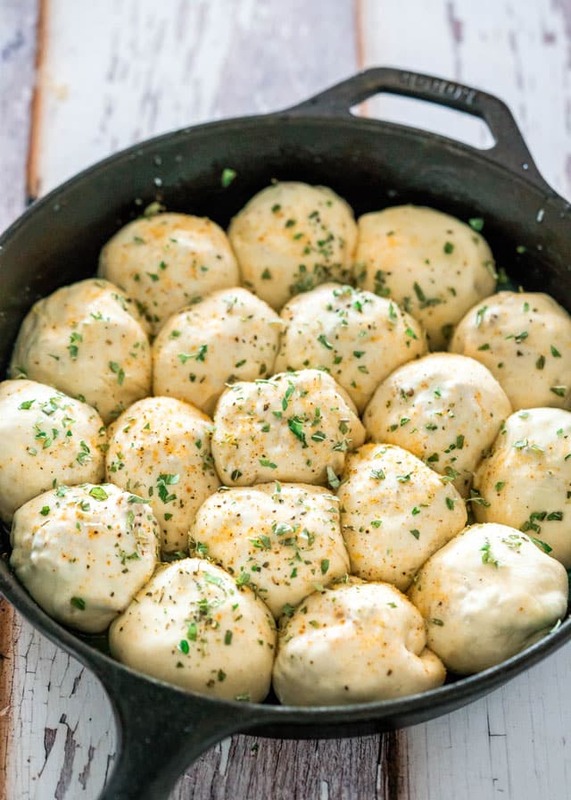 I would love to make this, but I think I will have to make my own dough, I have never seen frozen bread rolls in Germany. My kids would love these. That works or if you have Pillsbury crescent rolls or biscuits there, you could use those. I came across your website quite sometime ago and have made many of your recipes- all I might add delicious. This one hits the mark, as added to a salad it makes a filling meal. All of my six dogs look on hopefully that a crumb will drop their way! I’m a Brit but love the Canadian and American take on food. Thank you for posting, it’s much enjoyed.